Mother-of-five, Ana, 42, from Dondo, Mozambique near the city of Beira. Aerial view of the city of Beira. 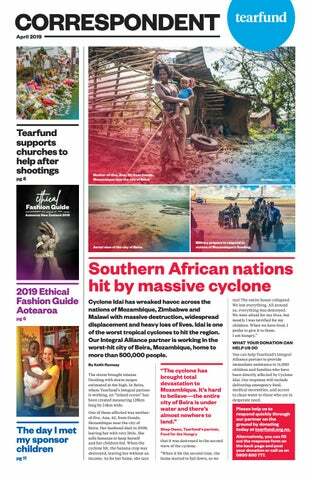 Southern African nations hit by massive cyclone Cyclone Idai has wreaked havoc across the nations of Mozambique, Zimbabwe and Malawi with massive destruction, widespread displacement and heavy loss of lives. Idai is one of the worst tropical cyclones to hit the region. Our Integral Alliance partner is working in the worst-hit city of Beira, Mozambique, home to more than 500,000 people. By Keith Ramsay The storm brought intense flooding with storm surges estimated at 4m high. In Beira, where Tearfund’s Integral partner is working, an “inland ocean” has been created measuring 128km long by 24km wide. Military prepare to respond to victims of Mozambique's flooding. WHAT YOUR DONATION CAN HELP US DO You can help Tearfund’s Integral Alliance partner to provide immediate assistance to 11,000 children and families who have been directly affected by Cyclone Idai. Our response will include delivering emergency food, medical necessities, and access to clean water to those who are in desperate need. Please help us to respond quickly through our partner on the ground by donating today at tearfund.org.nz. Alternatively, you can fill out the response form on the back page and post your donation or call us on 0800 800 777. What's in this issue? By Keith Ramsay Welcome to another issue of the Correspondent. By now many of you will be familiar with our Ethical Fashion guide. Thanks to those who support it, we are seeing the fashion industry responding positively by making strides to reduce exploitation in their supply chains. This year we are also rating clothing companies on their environmental impacts. You can see how your favourite clothing companies scored on pages 6 and 7. Inside Out By Ian McInnes I have been deeply impacted, as I am sure you have, by the horrific shootings at two Christchurch mosques, and by the national outpouring of grief and love that followed. Tearfund is responding in Christchurch through Southwest Baptist Church who had an established refugee resettlement programme with families now tragically impacted. Their groundbreaking neighbourhood ministry model is wonderfully suited to providing wrap-around care to those most affected. the Lebanese Church reaching out to Syrian refugees. Following the Syrian occupation of Lebanon by the Syrian army, many Lebanese people regarded the Syrians as enemies. But Christians have had to overcome their prejudices and are daily sharing the love of Jesus with them. You can read about Kerrie’s visit to Lebanon on page 3. It is tough to fight poverty on your own—it often becomes a fight for mere survival. But what happens when people join forces for change? On page 5, we take a look at how people in our Empower Self-help Groups are breaking down the barriers of poverty and negative social issues in their communities. The results are amazing. Rachel’s story of her visit to meet her sponsor children on page 11 makes for a good read for all who sponsor children. Her experience is heart-warming and confirmed to her that sponsoring children really makes an impact. We hope you are encouraged reading about what you have helped to achieve through your support of Tearfund and our partners' work. friendship and the God of peace is able to cast out all fear, draw all to himself and embolden us to reach across in times of great suffering. Tearfund is determined to help equip the church of New Zealand for such a task. Our Justice Conference events in Auckland and Christchurch, as well as Helen Manson’s Celebration of Humanity Photography Tour, are just two of the ways you can be touched and equipped as you explore issues of our common humanity and what God might be laying on your heart. Helen is Tearfund’s premier storyteller and photographer, capturing the best and worst of humanity—yet she somehow manages to find that ray of hope as God breaks through and reminds each of us that a new dawn is coming, and we are invited to step into that with Jesus. 3 occupation were devastating for Lebanese people and many lost family members, homes and livelihoods. Only six years after the withdrawal, Syrians started pouring into Lebanon to escape their own civil war, but this time as scared, desperate refugees. Faced with the choice of helping or turning away, the Church in Lebanon has chosen to offer unconditional love and support, despite how it has triggered reminders of their own pain and loss. This was incredible to witness. I was inspired to see the Church living this out and to see the way God is working through the way they are putting their faith into action. Their unity across denominational lines and total dedication to the Syrian refugees has resulted in thousands of families receiving monthly food packages, extra resources to survive the cold of winter, schooling for their children, child-friendly spaces for pre-schoolers, medical and dental care, hygiene packs, and initial settlement support. The Lebanese Church shows compassion Kerrie Palma, top right, and Tearfund's Andrew Robinson (front right) with a group of New Zealand pastors visiting a vocational training centre, Lebanon. hundreds of thousands of people have been killed. That is a set of very sobering statistics. But in fact, the opposite was true. I’ve returned to New Zealand full of hope and inspiration. The local church in Lebanon is responding to this crisis with costly, sacrificial love. They have embodied Jesus' words in Matthew 5:44: “But I tell you, love your enemies and pray for those who persecute you.” A Syrian military intervention in 1976 during the Lebanese civil war led to the occupation of Lebanon by Syrian troops which lasted until 2005. That is very recent history. Jesus as the king of not only the Jews but Lord of the whole cosmos. The resurrection of Jesus is the sign of a world restored to the way it’s “supposed to be”. Raising Jesus was an act of justice. The resurrection is the start of God’s work of new creation, of restoring the world to the way “it’s supposed to be”. nothing wrong” (23:41). There’s a complete failure of justice as Pilate, who has the power to release Jesus, is swayed by certain Jewish leaders and the uncontrollable crowd to release a known criminal and rather crucify Jesus (23:25). What good is there in this? It’s a complete miscarriage of justice by those in power and a betrayal by those closest to Jesus. That’s why, when Luke tells the story of Jesus and his resurrection, there’s a challenge for us to participate in Jesus’ work of restoration. In Luke 24:4449, we see Jesus showing his disciples how his story is the great fulfilment and climax of the drama of Scripture. The disciples are sent into the world with power from on high to proclaim the message of repentance and forgiveness, so that God’s healing work of restoring the world can continue. of God’s hand at work and the power of the local church to impact the world is shining so clearly out of this dark situation. If your church would like to hear these stories in more detail, we would love to share them with you. Just contact enquiries@ tearfund.org.nz and I’ll be in touch! We also hope to have another field trip happening in 2019, so please register your interest with us at enquiries@ tearfund.org.nz if you would like to see the work first hand. message of hope to those tempted to think that God has forsaken humanity. The resurrection gives us hope for a just future and an invitation to participate in God’s work of undoing injustice and making the world the way “it’s supposed to be”. Anil Govind sheltering from the rain during a farm visit in Sri Lanka. reach their potential as adults. But the hungry mouths of the calves must be balanced against the ever-present needs of the family for basic income. The constraints of environment and resources in Sri Lanka really make a folly of any comparisons with dairying in New Zealand. that regard. These are people looking to rebuild their lives and their communities. The project is simultaneously about building infrastructure in Sri Lanka and creating opportunities for everyday people. The most humbling aspect of what we witnessed was the attitude of the people. The adversity they have faced has undoubtedly forged their resilience. The farmers we met, though their resources might be meagre, their pride over what they are achieving was abundant. *Name changed for security reasons. This project is part of our Empower Cause which brings people together to work their way out of poverty. If you want to support other projects like this one, you can donate to our Empower Cause from just $35 a month. Farmers soak up knowledge from a kiwi farmer. You can support our Empower cause from as little as $35 a month. If you would like to learn more, please contact us at enquiries@tearfund.org.nz. A Self-help Group gathers to encourage one another in Ethiopia. The power of many When it comes to a fight, the more people you have on your side, the better chance you have of overcoming whatever is standing against you. Poverty is the common enemy of many. While strides have been made to reduce the numbers of people living in extreme poverty on less than $1.90 a day (now about 10% of the population), nearly half of the world’s population are still struggling to meet their needs on less than $5.50 a day. By Keith Ramsay Left to face the daily challenge for survival by yourself can be overwhelming for people living in such poverty, but what happens when people band together to overcome the barriers that keep them in poverty? Tearfund’s Empower projects bring people together to tackle the problems that keep them in poverty. Empower is built on the evidence that people living in poverty are their own agents of change rather than merely recipients of aid. Our Empower projects promote economic, social and political empowerment, and have a focus on personal development, relationship-building, collective problem-solving, collective action, self-reliance and self-learning. And the results are heartening. Selfhelp Groups (SHGs) are one of the approaches to poverty reduction within our Empower cause. SHGs promote savings and loans for small business enterprises, but they also bring many social changes through building strong, caring networks in communities. SHGS, A POWERHOUSE FOR CHANGE In Tearfund’s SHGs in the Horn of Africa, group members are encouraged to become drivers of change in both their lives and their communities. Mutually supportive relationships are key; members often view the groups as sanctuaries where they can discuss their problems and build trusting relationships that support them through personal crises. It is in these relationships and networks that some of the most exciting changes can be seen. being dependent and started being income earners; above all, the power to make change happen, rather than have it as something that happens to them.” Independent research studies show that Tearfund-supported SHGs in the Horn of Africa are an effective means of creating sustainable livelihoods, increasing resilience to shocks and stresses (economic or natural disasters), and alleviating poverty in urban and rural areas. members supported by Tearfund. Virtually all SHG members were able to buy and/or produce more food and were better able to feed their family than a year earlier, and 88% of survey respondents increased their income over the 2017-2018 year. momentum that is creating ripple effects into communities where SHGs are established. There are visible signs of community-wide social change as group members lobby local government for services such as water, and the groups band together to tackle local social problems. and the planet are exploited in the process of making our clothes. A: The environmental management section asks brands the big questions about how they are monitoring and mitigating their environmental impact. It assesses whether a brand has measured its environmental impact throughout the supply chain, the percentage of sustainable materials used, if the brand has collected data on water use and chemical use in its facilities, monitoring systems to improve chemical and water management, and take-back/repair programmes offered to customers. environment. Through assessing which materials and facilities they are using, brands can take informed steps to reduce their environmental impact—from the farm, all the way to the final product. And, in turn, consumers can be aware of who’s doing their bit for our planet. Q: What can I do as a consumer to help companies improve in this space? A: Use your voice as a consumer to challenge your favourite brands to think about their environmental impact, if they’re not doing so already. Focus on buying sustainable fibres like organic and recycled natural fibres, recycled polyester and nylon, Lenzing TENCEL and Monocel, and responsibly sourced wool and leather. A vote with your wallet is a powerful one, so think about the environmental impact of a garment before you buy. failing to pay the price of its environmental impact. In our work of seeking justice and an end to poverty and exploitation, Tearfund wants to encourage companies and consumers to connect with the people who make their clothes. in their supply chains. When you buy from brands with good grades, you’re supporting fair working conditions and care for the planet. Get the Ethical Fashion Guide today and connect to create change. What 's new t his year? Environmental Management Q: What does the environmental management section include? Together, we can change a system of exploitation to one of fairness and sustainability. Fashion Guide Aotearoa New Zealand 2019 The guide is a practical tool you can use to reduce worker exploitation and alleviate poverty in developing countries where clothes are manufactured. It grades brands on ethical practices in their supply chains, giving you the power to shop ethically. A-F grades are awarded to companies as a measure of their efforts to address worker and environmental exploitation in their supply chains. Raw materials: Farm-level (for example, cotton farms). Inputs production: The production of fabric, leather and other products. Final stage production: Factories that sew clothes together for distribution. Justice Conference brings you a mini event By Sophie Rice With over 600 attendees, 38 speakers, 19 partners and 17 sessions, The Justice Conference 2018 was a world-class event and an inspiring gathering, equipping Kiwi Christians to engage with justice in Aotearoa and beyond. And in 2019, we’re back! Poet and speaker Joel McKerrow at last year's Justice Conference. music from Aro’s debut bicultural album, Manu. Our last event sold out, so if you’d like to join us, head to thejusticeconference.org.nz now to get your ticket. Sept 10 and 11, 7pm-9.30pm. $10 tickets including drinks & nibbles. Crave Cafe Kingsland, Auckland. Tickets COMING SOON! churches from different denominations have been doing to provide support to their Muslim community. Tearfund is working with Christchurch’s Southwest Baptist church which has a refugee and migrant resettlement programme. Southwest Baptist is helping to support refugee families affected by this tragedy by organising meal rotas, hospital visits, trauma support, strengthening refugee and neighbourhood community programmes, liaising with social services, and providing pastoral care for those involved in supporting the families. Flower tributes for Christchurch shooting victims outside Mt Roskill Mosque. this act of premeditated evil happened on our own soil. We will be partnering with other churches in the region to assess where the greatest needs are and where we can provide assistance. Tearfund also wishes to support churches nationally as they frame a Christian response to issues of violence and tolerance, and ask deep questions about who is my neighbour and how would Christ respond. 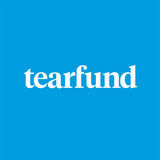 You can help support the work Tearfund is doing through Christchurch churches by donating today at tearfund.org.nz. as she shares stories and images about some of the amazing work being done by organisations all over the globe. These powerful images celebrate our deepest emotional connections through A Celebration of Humanity. Helen’s tour is promoting Tearfund’s child sponsorship. Helen will be travelling to Queenstown, Christchurch, Wellington, Tauranga, Hamilton and Auckland from May 19-26. Register for your FREE ticket by visiting tearfund.org,nz. Making your Mother’s Day gift-giving easy By Laura Brookes Mums the world over are special, so why not bless two mums this Mother’s Day by gifting your mum a Tearfund Gift for Life? From newborn care to coffee plants to women’s literacy training, Tearfund’s Gift for Life catalogue is brimming with ways to honour your mum or loved one. By giving a Gift for Life, your mum will receive a special card telling her you have donated a life-changing gift on her behalf to a mum in need overseas. You can help mothers like Asniman from Indonesia, who received vital information on newborn care from someone who purchased Snuggles as a Gift for Life donation. Celebrate this Mother’s Day with a gift that’s a little different. She’ll love you for it, and so will the mum who receives it. With every Gift for Life purchase, you’re helping to make a tangible difference that not only impacts the individual or family but has flow-on effects for the entire community. Visit giftforlife.org.nz to give a life-changing gift today. Celebrating our Poverty Cycle story By Laura Brookes Wow. What a month! More than 115 of us took up the Poverty Cycle challenge, banding together to reclaim well-worn trafficking routes with exercise and fundraising to help bring freedom to people trapped in slavery. To every individual, team and supporter— thank you! This always has been and always will be a team effort. It’s your story as much as it is ours, so today we wanted to give voice to one of the amazing Kiwis who took up last month’s challenge—Pip Harrison. Pip says she is pleased to link her community with what is happening in Thailand by raising money for the Poverty Cycle. Donations for the Poverty Cycle are open until April 30, 2019. Visit povertycycle.org. nz and donate to the Harrison family’s challenge today! More about Katie Spotz Katie is an author, marathon runner and long-distance swimmer swapping her running shoes for pedal power to ride the 2019 tour. Through most of her events, she raises funds for access to clean water. Katie was voted American female achiever of the year in 2014 and interviewed by all the main American networks along with Forbes Magazine. Katie shared some fascinating life stories at one of the nightly peloton parties on tour. New Zealander, Rachel Jenkins, holds Joy, her sponsor child in Kampala, Uganda. Her sponsor child’s brother waves to the camera beside them. HELLO When I arrived at the first Compassion project, I was greeted by an understandably cautious and shy young Joy. After all, she is only six! Leticia, on the other hand, has just turned 16, so at her project, I was greeted by an older (still cautious and shy) young lady! But it didn’t stop them both from welcoming me with the sweetest, most sincere hugs. Rachel stands with her arm around Leticia, her teenage sponsor child in Kampala, Uganda. arranging, cooking, and how to play a musical instrument. This means that by the time they graduate the programme, they leave with practical life skills on top of their school education. This helps set them up for the next stage of their life and also provides greater opportunities to generate income. I also had the opportunity to look through the personal folders of both my sponsor children. Each child in the project has one. It contains all of their school report cards to date, detailed notes from their yearly medical check-ups, dental records, all the letters that they have written to their sponsors over their time in the project and much more! Being the older one of the two, Leticia’s folder was larger, and it was amazing to see how she had developed and grown over the years. I felt like I could catch up on her life even though I have only been sponsoring her for a few months! photos, smiles and expressions of gratitude. It was an incredible privilege. Leticia’s 16th birthday was a couple of days before my visit, so I arranged for a birthday cake that we could share together with her family. It was a beautiful celebration, and the cake was shared by everyone in the immediate area around her house. Before leaving, both my sponsor children and their families presented me with a gift. They said it was not much, but that they wanted to thank me for coming to visit and also to thank me for loving and valuing their child and providing her with opportunity and hope for the future. This was so incredibly special! FINAL REFLECTIONS It’s hard to put into words the mixture of emotions I felt during these two days. My two sponsor children are at different life stages and growing up in differing circumstances. Different to one another, and different to myself. But despite the ups and downs that Joy, Leticia and their families have endured in this journey we call life, I felt so encouraged and humbled by their faith, hope, joy and commitment to each other. It was also encouraging seeing that Compassion is on this life journey with them. They are partnering with the children, their families and their community, encouraging them, empowering them and providing opportunities for them to learn, grow and flourish. You can change a child’s life for just $52 per month. The children featured on this page are waiting to be sponsored. Will you make their day by sponsoring one of them? When you decide to sponsor one of these children, you decide to start a life-changing journey with them. Other $ Tearfund is a registered charity. Charities Act 2005 registration CC21725. Donations $5 and over are tax deductible. To sponsor a child in this edition, call us on 0800 800 777. Fetehu lives in Ethiopia with his mother and father. Luis lives in El Salvador with his mother and father. Francis lives in Philippines with his mother and father. $10 extra per month covers additional needs like unexpected medical treatment and helps to support other children still waiting for sponsors. Your details Fill in this section if you are making a donation or if you’d like to sponsor a child. We’d love to start journeying with you! Joe lives in Ghana with his mother. Ervadson lives in Haiti with his mother and father. Nshimiyimana lives in Rwanda with his mother and father. Deysis lives in Nicaragua with her mother. Maria lives in Colombia with her mother. Jennifer lives in Ghana with her guardian. Maria lives in Kenya with her mother and father. Vivi lives in Togo with her guardian. Anagrace lives in Tanzania with her mother and father. Motivated by Jesus, we encourage Kiwis to act for justice and relieve poverty among the world’s most vulnerable people. Sean du Toit, Rachel Jenkins, Kerrie Palma, Anil Govind. Art Direction and Design: Alex Carter, Simone Cashmore. Printing: PMP Print.